bombay veg sandwich - popular mumbai street food of delicious sandwiches made with mix vegetables, green chutney and a few spice powders. just add a pinch or two of salt as chaat masala already has salt in it. grind the chutney ingredients till smooth. no need to add water. but if you cannot grind, then add 1 or 2 tsp of water. collect the coriander chutney in a bowl. check the taste and add more salt if required. cover and keep the chutney aside if you are making veg sandwiches immediately or else refrigerate. boil or steam the beetroot and potatoes till they are tender. once cooled, thinly slice the beetroot and slice the potatoes. peel and thinly slice onion and cucumber. thinly slice the tomatoes as well. trim the edges of the bread slices if you want. butter the bread slices evenly and very well. now apply the coriander chutney to the slices. place all the veggie slices one by one. sprinkle the black salt and chaat masala on each one of them or alternately. cover the sandwich with the other bread slices. slice the veg sandwich into triangles and rectangles. 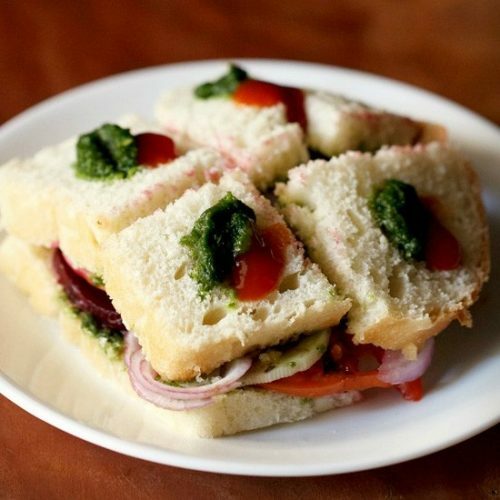 serve bombay veg sandwich immediately with tomato ketchup and the coriander chutney. you can cook the potato in the microwave. wash the potato well. prick the potatoes with a fork and microwave in the oven for 4-5 minutes. when the beetroot & potatoes are getting cooked, you can slice the other vegetables and make the chutney. you can use whole wheat bread or brown bread or multigrain bread or white bread. but the best taste in veg sandwich comes with white bread. dairy butter is used in these veg sandwiches. but you could easily use vegan butter. you can also toast these veg sandwiches if you prefer.